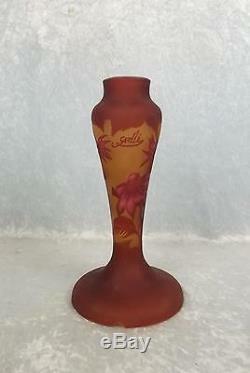 Gallé Tip Reproduction Cameo Glass Table Lamp Base A stunning opaque art glass lamp base in the style of Émile Gallé. The lamp is of baluster form with a pattern of flowers in a reddish brown on an amber ground. The lower quarter and upper quarter are of a solid reddish brown and the flowers are highlighted in pink. It is hollow inside with a semi-circular cut out to the edge of the base for a lamp cable to thread through. The lamp is signed Gallé as well as Tip. The Tip tells us that this is a reproduction lamp, but these lamps have become rarer as the years go on and have become highly sought after items in their own right as they are recognized by collectors as by far the finest reproductions of Émile Gallé lamps there have ever been. Dimensions The piece has a diameter to the base of 6 ¼ inches (16cm), a diameter to the widest part of the stem of 4 inches (10cm) and a height of 12 inches (30.5cm). It weighs 1.01 Kg Condition The piece has a couple of small dark scuff marks but overall It is in a lovely condition with no chips or cracks. For further details and condition see pictures below... The item "Gallé Tip Reproduction Cameo Glass Table Lamp Base" is in sale since Sunday, March 27, 2016. This item is in the category "Pottery, Porcelain & Glass\Glass\Art Glass\French\Emile Galle". The seller is "theantiquesstorehouse" and is located in Portsmouth.